My assumption was that the maker culture lent towards high-tech engineering; electronics, robotics, 3-D printing… and that these pursuits were favoured over more traditional craftsmanship. The term suggests a focus and drive for a physical solution, solely market driven and perhaps even irrespective of need. As someone who runs an architecture charity (AzuKo), believing in people and process over product, I wasn’t sure if our design ethos would align. However,when the opportunity arose to join Hello Shenzhen, a bilateral exchange programme connecting makers inthe UK and China… I jumped. "I like to be proven wrong, so let’s do this." Our partner Shenzhen Open Innovation Lab (SZOIL) is a powerhouse in China, driving conversations around the maker movement and acting as a connector within the country and internationally. This meant that when I landed the process of gaining trust within a community, bringing a range of stakeholders to the table, and accessing resources that often takes many months to achieve, was fast- tracked. 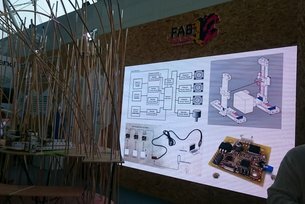 SZOIL and partners have a long-term vision for Fab Lab education in rural China. They aim to build capacity and increase opportunities through open-source, digital fabrication, but the idea is still a seed. At AzuKo, we believe education and community participation are key to sustainable development – an indicator that I was in the right place. To pilot such an initiative, conversations need to happen. It became clear that’s where I could provide support; to spark this dialogue, generate ideas and create debate. To really understand a context you must live, work and immerse yourself in it. You must learn the language because this is how a culture lives and breathes… and you need to share many cups of tea. This all takes time. With only a month and it being my first experience of China what would be possible? The team had connections to a sleepy village called Xinguang, in Guangdong province. A 1.5 hour drive from the dense and bustling city of Shenzhen along the Pearl River Delta towards Huizhou. I soon found myself living with a local family. My aim (despite not speaking Mandarin or the local dialect) was to gain as much insight as I could. How do people live here? What are the challenges and opportunities? Do they have a shared vision for the future? What skills, knowledge and resources could be harnessed? It was also my hope to break down a few barriers by not simply being an outsider arriving on a site visit once a week. I wanted to spend time with the community, share their way of life and learn from them. Humility at the heart of it. Xinguang, like many villages in many parts of the world, has a drive to modernise. There is a desire for larger, better equipped homes and increased income through more efficient agricultural processes. There is also a push to develop tourism and revitalise the region. One by-product of this move to modernity, is the desertion of more traditional residences, resulting in ‘ghost towns’. These old, simple brick buildings do not provide the same level of comfort as the newer multi-story, concrete framed dwellings. However, could they have another function? Could they be part of the future for Xinguang, rather than it’s forgotten past? So we decided to stir things up and released a call to Chinese and international designers, innovators and thinkers to reimagine a new life for these buildings. In under a week we asked people to develop ideas that we would exhibit in Xinguang. It would be the first exhibition ever held in the village, and we were told the first most villagers would have ever attended. We received 32 proposals from 12 different countries, including China, India, Poland, UK, Venezuela and Vietnam. A global response to this unknown community. On Sunday 26 March we showcased 12 shortlisted entries in a local ancestral hall within Xinguang. Visitors travelled from Shenzhen and from across Tonghu town. Heads of over 20 villages were invited, along with organisations operating in Huizhou and local authority. We weren’t expecting such a response as people continued to descend on the small communal square. Despite the forecast for rain, the sun came out and the event got underway. Throughout the afternoon we took groups on tours of the exhibition, ensuring visitors fully understood the works on display. An international jury consisting of Ms. Katrine Hesseldahl (Industrial Designer, RCA), Mr. Jason Hilgefort (Architect / Academic Director, Future+), Mr. Lai (Vice-Director, HZZK) and Ms. Chen Zhu (Vice Chairman of Shenzhen Architects Association) had a very difficult decision to make. They awarded a winner and three honourable mentions (best art initiative, best programme and best story). The general public also voted for their ‘people’s choice’ award. The jury praised all the shortlisted entries for their diversity, quality and design prowess. They were particularly impressed by ‘We Grow Older Together Here’ due to its sensitivity to the context of Xinguang, detailed site analysis and holistic approach. The project focused on improving facilities and infrastructure for the elderly and young, proposing to use the derelict buildings to house these new functions. As the exhibition came to an end, we were all invited to share in the feast of a wedding party in the village, and rose our glasses (of some very strong stuff) to continued conversations. As I’m writing this, it’s difficult to associate with my earlier assumptions of the maker culture as I crossed the border from Hong Kong. My experience as a ‘maker’ over the last month has been entirely community focused, working with partners passionate about the process, about sharing skills and responding to real social needs. If this is what being a maker means… I’m pleased to join the tribe.